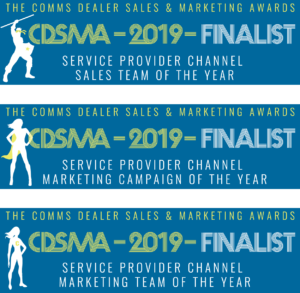 We’re thrilled to announce that we’re finalists in the Comms Dealer Sales and Marketing Awards! Entering its 8th year, the CDSMA is one of the Channel’s most renowned awards ceremonies, giving businesses a chance to celebrate the teams that are the voices and faces of the company. We’ve taken the Service Provider category by storm, having been shortlisted for all three of its awards. Over the last year, our Marketing Team has carved out success for the business with their outreach efforts, illustrating the power of IoT to an audience of over 500,000. The Sales Team has recently secured our biggest deals yet, enabling us to connect hundreds of yachts and one of the biggest airlines in the world. And in the face of an energy crisis, our top Marketing Campaign will help transform the energy game for UK businesses.